I was amazed but unfortunately not surprised to see the methods that Lloyds TSB (which is being propped up by my taxes) is using to try and cajole first time buyers into the UK housing market. The product being peddled justified a four page advertisement in a major London newspaper and is called the Lend a Hand Mortgage. The advertisement starts with “as a response to the current market conditions, the Lend a Hand Mortgage is giving first time buyers the opportunity to get help with their mortgage from family and friends.” From what I read it doesn’t look like that great a deal to me. Lloyds claim that “in 1999, 592,000 first time buyers completed mortgages, by last year it had fallen to 193,000, according to the Council of Mortgage Lenders,” My chart today demonstrates clearly one of the big drivers of why this has occurred. 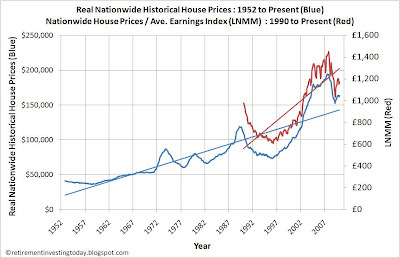 For the year 1999 the ratio of Nationwide Historical House Prices to the Average Earnings Index (LNMM) was an average 742.7 and in 2009 this had risen to 1139.1. That means affordability has reduced by 53%. This un-affordability has been caused by the very same banks that are creating products like that advertised extending ever easier credit which is what put us in the current mess we are in today. The mortgage advertisement goes on to say “even as recently as a couple of years ago, it was much easier to get a mortgage... and it was not uncommon to get a 100% mortgage that didn’t need a deposit.” As we all now know that was just foolish. I’m still amazed this occurred. If you can’t put together a deposit for a mortgage just how did the banks expect people to be able to afford to repay that mortgage. Additionally the banks were counting on property never decreasing in value plunging people into negative equity. Even the most naive banker by spending 10 minutes on the internet could have found historical data that showed how false this assumption was. Some more data provided in the mortgage advertisement states that “according to the Council of Mortgage lenders, in July last year 80% of first time buyers were turning to their parents for help, up from 50% in February.” To have included this Lloyds clearly think that this adds to the sell. What’s it saying? Everyone else is doing so you should to? Personally I find that a terrible statistic and quite sad. House prices are so over valued compared to earnings that it is almost impossible for a first home buyer to buy a roof to put over their heads without external support. Basic human needs are food, clothing and shelter. Now we are in a situation where one of the basic human needs is now unobtainable without support. What type of country are we living in? - The ‘helper’ gets their money back after 42 months “provided the buyer doesn’t default on their mortgage payments, and provided the amount of the mortgage compared to the value of the property (LTV) has dropped to 90% or less – as assessed by us...” So Lloyds have cleverly protected themselves from a house price crash of up to 25% for the next 3.5 years by effectively offering a 75% mortgage. - Should Lloyds have only offered first home buyers the 75% mortgage it would have meant that a £5,000 deposit could have only secured a mortgage of £15,000. Instead, this scheme can leverage the first home buyer up to a mortgage of £95,000 while providing some protection to themselves. - The mortgage is a repayment mortgage however to demonstrate quickly how much this mortgage benefits Lloyds I’m going to assume an interest only mortgage (ie no principle is repaid). Both final amounts I’ll present would be a little less if calculated as a repayment mortgage although not by much as the principle reduction per year is very small in the early years of a mortgage. Let’s look at what happens in the first year. So the buyer who takes a standard 75% mortgage provides Lloyds with charges of approximately £15,000 x 5.69% = £853.50. Now the buyer who takes a ‘Lend a Hand’ provides Lloyds with charges of approximately £75,000 x 5.69% + £20,000 x (5.69%-4.15%) = £4,575.50. - The first home buyer ends up over leveraged and indebted for life which is what put us into the credit crunch in the first place. - Lloyds ends up squeezing more than 5 times the revenue out of the same customer. The only difference is that this time Lloyds are a bit cleverer and give themselves some more protection than previous times. I’m not convinced the product is designed to give “more people...a chance to own their first home” more likely a chance for Lloyds to maximise its revenues. I’m remaining out of the house market for now and the more I read about these types of products the more I think current prices are unsustainable. I understand what you are saying but I suggest your figures are supposing the helping hand is totally removed. However the fees you are showing are nevertheless very steep. I think a product like this should not be taken on face value and investigated. I think I understand what you are saying. I am suggesting that the helping hand is totally removed as without the helping hand the bank would only be prepared to offer first home buyers a 75% LTV mortgage which is what my figures were based on. This would then make current house prices unaffordable and so the bank can't follow this route and so need to get clever. Back in the old days (and I'm not that old) when I applied for a mortgage the bank wanted me to demonstrate that I could save a minimum deposit of 10% for a house (on top of that I had to pay all the fees and valuations also from savings). If I could do that and then had a sensible borrowing to earnings multiple from stable earnings I could get a mortgage. At no time did the bank encourage me to go around to my friends and family and ask them for money. I guess it was a different era when house prices were much more sensible so a first home buyer had a chance.